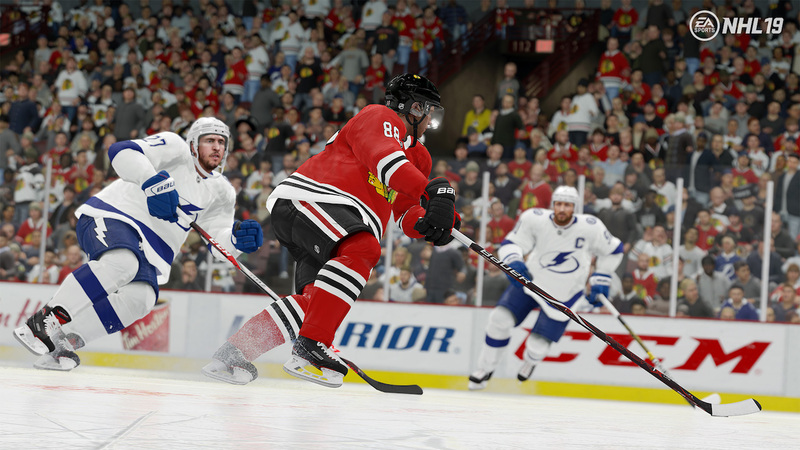 With newly added modes like World of CHEL and the inclusion of Real Player Motion, NHL 19 adds a new layer of polish onto last year's advancements in stick control and shooting. The end result is one of the best hockey games ever. For the last few years, developer EA Vancouver has been working toward creating the best hockey experience on the market. Each year, they’ve added new features and tweaked older, more established ones, and incrementally, the NHL franchise gotten better and better. For NHL 19, it all comes together to present one of the best hockey games ever, and while that’s an admittedly heady declaration, there’s still room for improvement. As with most sports video games, there’s not much more you can do to represent that actual sport. EA Vancouver checked the boxes in recent years with their incredible stick control options and player-controlled dekes, and last year’s entry even gave the player more control on the ice, creating options for between-the-leg passes and multiple ways to shoot the puck, accentuating finesse as much as force. 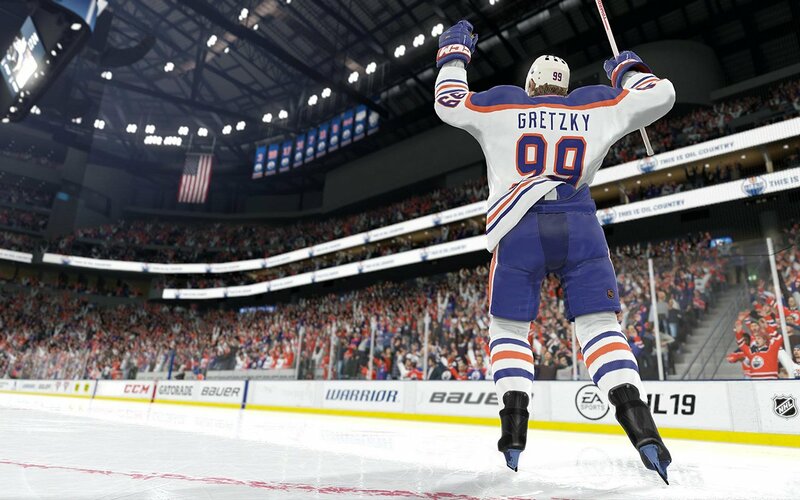 NHL 19 adds EA’s Real Player Motion technology, which allows players on the ice to move realistically, with new player animations that help blur the visual line of what’s real and what’s virtual. I’ve seen things in this game I’ve never seen before in a hockey game, and each time my winger crashes into the goalie and gets flipped on his head or a bone crushing check knocks a helmet off — and the player remains helmet-less until the next break in the action — I can’t help but feel that the virtual hockey experience has reached new heights. Skating and player movements have been refined, and being on the ice feels incredibly natural. Not every player skates, turns, and glides the same way; you can really tell the difference between an offensive defender and a blue line stalwart, and knowing your players and your lines’ strengths are the keys to on-ice success. And this game is fast; faster than any other NHL game I’ve ever played. It took a few games to get used to, but once I finally caught up to it, I was in heaven. Shooting was revamped during last year’s game, and now that the player movements on the ice have caught up, the whole package has come together to create something special, not only to fans of hockey, but fans of sports games as well. That says something. NHL 19 introduces a brand new game mode dubbed World of CHEL (if the pronunciation confuses you, focus on the second half of N-H-L). You create and can customize a player (male or female) with almost 1,000 options, including pads, outerwear, skates, head gear, and more. From there, he/she can be used in various game modes, both online and offline, like the new Pro Am mode, where the player joins a team of three NHL stars and plays other teams as they move up to bigger and better competitions. Also new is NHL Ones, a 1v1v1 game with other human players to score the most goals in a set time. NHL Threes returns, which is an arcade like 3v3 exhibition mode that really takes things over-the-top. The player can also join an EA Sports Hockey League team and compete with other user-created players and NHL superstars. When it comes to progression, the player earns XP and gear bags for nearly everything they do. World of CHEL replaces any kind of “story” mode that NHL 19 may have had, and frankly, I enjoy this variety more than some canned narrative about a young player reaching his professional NHL dreams. I’ve thoroughly enjoyed playing NHL Ones against strangers online. I drop in, play a few pick up games, and then drop back out to check out my earned gear and upgrade my character. Gear comes in different levels of rarity, making it addictive to try and find legendary or epic gear, and the entire experience is all very fluid and seamless. 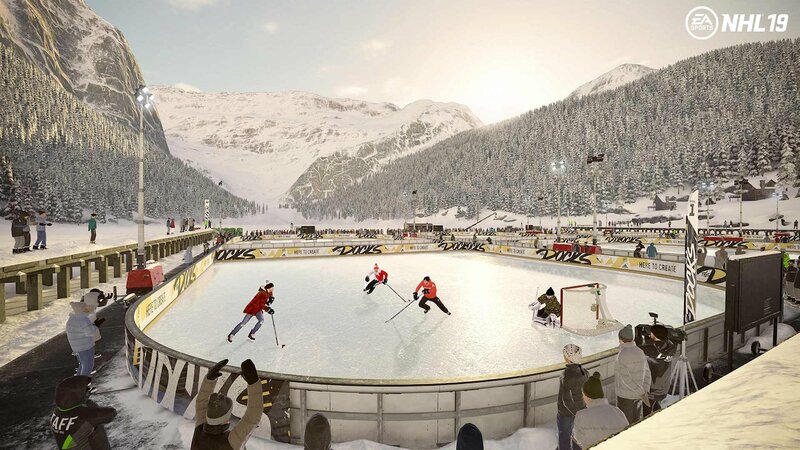 Another draw here is that Pro Am games and NHL Ones matches are played in outdoor rinks, which looks as great as it sounds. These rinks start small with tiny crowds, but get bigger and more grand as the player progresses. World of CHEL gives gamers a unified playing experience, where their created player competes in various modes that best suits their play style as they climb the ranks of hockey stardom. NHL 19 brings back other fan-favorite game modes, like card-based Hockey Ultimate Team (HUT) and a newly revamped Franchise mode, where scouting has been overhauled to create a better, more realistic team building experience. Legends have been added to HUT, like Wayne Gretzky and Mark Messier, and players can even pull a few legends and add them with the current star players to create Hero Teams. It’s a hockey lover’s dream come true — there are over 200 legends in NHL 19, and nothing beats the thrill of opening a pack of HUT cards and seeing that gold tinged image of Patrick Roy, ready to join your team. The game engine used in NHL 19 has yet to go the Frostbite route, and that’s okay. Players have never looked better or more realistic, and the new animations help sell that. Mike Emrick and Eddie Olczyk return to the booth for commentary, with Ray Ferraro on the ice, and the NHL on NBC presentation helps to make season and franchise games feel real. The soundtrack is stocked with great music, but for some reason, EA Vancouver doesn’t give you the option to customize your soundtrack to pick and choose which songs you want to hear. Of all the EA Sports games I’ve played, this is the only franchise that hides the music from the player, which is annoying, but not a game breaker by any stretch. NHL 19 doesn’t reinvent the wheel — it just makes it better in every way. Eevery year, EA Vancouver has raised the bar higher, and this is an excellent plateau to stop on and enjoy the sights and sounds. New modes like World of CHEL give players so much to do in, and the addition of Real Player Motion makes it all look and play great. I’ve long said that that EA’s NHL franchise is one of the best simulated, annual sports games on the market, and NHL 19 proves me right in every way. And as much as I love this year’s game, I can’t help but think about what might be coming next year. Where exactly can EA Vancouver go from here? I guess we’ll find out soon. This review is based on the PlayStation 4 version of the game. A copy was provided by Electronic Arts.